How to lock up MCO? If you passed our KYC (Know Your Customer) verification and have access to the crypto wallet in your app, you can lock up your MCO tokens by tapping the Card icon in the bottom-right corner of the homescreen, selecting the metal card of your choosing and following the steps to lock up the MCO, when prompted. If you don’t have enough MCO in your account, you can either deposit them from an external wallet or exchange, buy them using other crypto available in your wallet, or use your credit/debit card (or Bank Transfer, where available) to purchase them in the app. What are the benefits of staking the MCO? 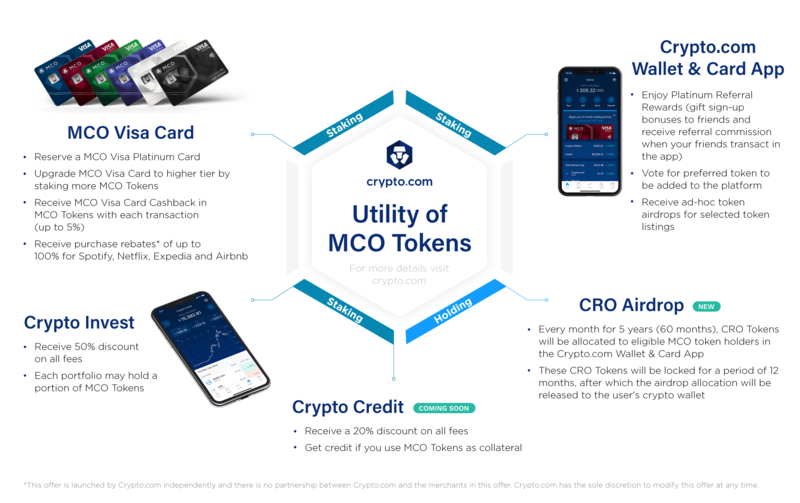 For details of different levels of benefits in relation to the amount of staked MCO, please refer to the wallet section of our website. Can I increase the staking amount? Yes. During the initial 6-month staking period you can increase the amount of locked up MCO, by going to your MCO wallet in the app and selecting the Upgrade button. You will be prompted to add the difference between your existing stake and the one you are going for (so, for example, if you currently have locked up 50 MCO and would like to increase to 500, you will need to add 450 MCO). The new lock up will reset the timer of your lockup and another 6-month period will start. It is currently not possible to increase your lock up amount after your MCO card has been issued. How can I unlock my MCO? However, your card benefits (e.g. Card Cashback (of up to 2%), LoungeKey™ Access, fee-free ATM withdrawal limits and Interbank Exchange Rates) will not change.